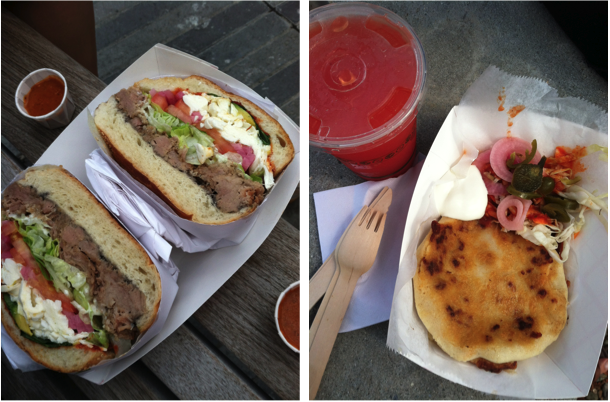 I finally made it to Smorgasburg recently and of course found myself overwhelmed with choices of what to eat. Marissa and I first split a mexican sandwich from Cemita's with carnitas, lettuce, tomatoes, pickled onions, white cheese, avocado and various sauces. With red hot sauce on the side this was a huge (and messy) winner. We digested for a bit and then dove back into the crowds for pupusas from Solber. We got one with pork and one with beans, cheese and jalapenos, and a strawberry lemonade on the side. We both preferred pork pupusa over the other. It was more moist and flavorful. Toppings on the side included pickled onions, peppers, lettuce, sour cream and hot sauce. Smorgasburg opens every Saturday of the summer through November 17th, rain or shine, in the location of the Brooklyn Flea. Seating is available within the gates of the tent market, but benches and green grass with city views are always available just outside the fence.